Christmas home decoration ideas that creatively blend old traditions with innovative designs and new materials look interesting and very attractive. Handmade wreath chandeliers are a novel Christmas home decoration ideas that add traditional Christmas wreaths to holiday decor in an unexpected and spectacular way. Christmas home decoration ideas often include making Christmas wreaths, but this clever idea to use traditional Christmas decorations for making wreath chandeliers adds fresh and impressive design to winter holiday decor. You can make just one small or large wreath chandelier for your Christmas home decoration or design a huge chandelier with two and three Christmas wreaths in different sizes. Made of green branches or artificial Christmas wreaths are great for this stunning Christmas decoration project. Christmas wreaths in any sizes can be used for making chandelier wreath designs, but if you use larger or smaller wreath sizes you need to make adjustments to the ribbon length and a ceiling hook size. To make these decorations of two wreaths you will need 22-inch wreaths and 28-inch wreaths, 50-60 feet of wired ribbon, scissors and a ceiling hook. For a small Christmas wreath cut three wired ribbon pieces approximately 5-feet in length. 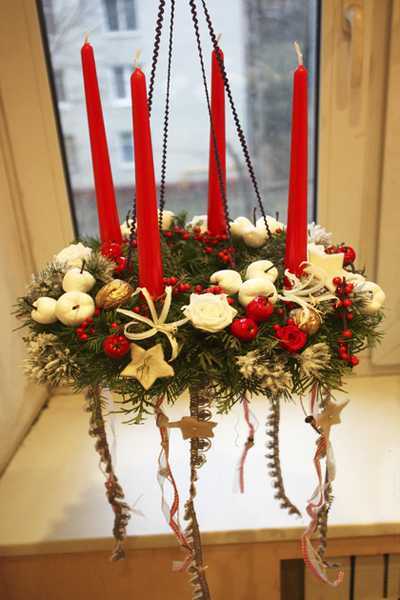 With the wreath facing up, tie ribbon to the wire frame of the wreath at equal intervals. Gather and knot the three ribbon pieces together about 15 inches above the wreath. For a larger wreath, you will need to cut 3 pieces of ribbon about 6 ½ feet long. Space them evenly round the wreath, and knot them to the wire frame at equal intervals. Gather and knot them about 20 inches above the wreath. Place a knot at the top end of the hanger ribbons. 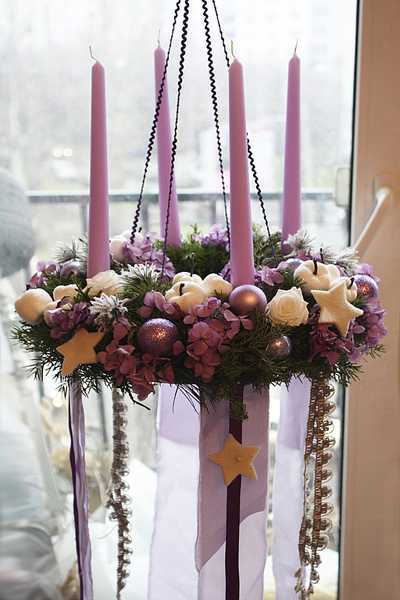 Place the larger wreath on top of the smaller wreath, aligning the hanger ribbons. The knot from the small wreath should be in the same place as the knot from the large wreath. Gather ribbons of both Christmas wreaths together, and knot them 20 inches above the center of the large wreath. Trim the ends of the hanger ribbons above the top knot to create a finished look of your beautiful Christmas chandelier. Screw your hook into the ceiling, and hang the Christmas wreath chandelier from the top hanger-ribbon knot. 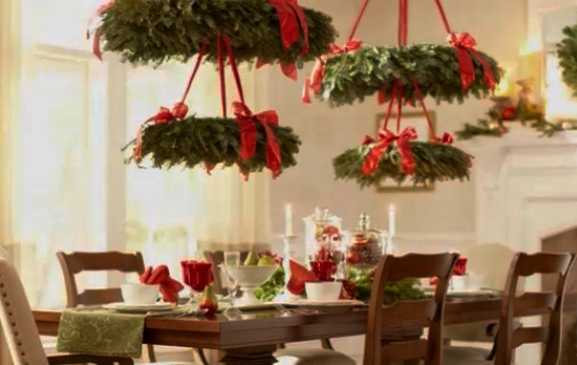 Once your Christmas wreath chandelier in the air, you can add unique Christmas decorations to it. Pine cones and berries, battery-operated Christmas lights, colorful bows and ribbons are excellent for designing original and impressive Christmas decoration.